As a parent, there are so many toys out there for my little ones, that it can be overwhelming to find the right ones! I strive to get them things that they will love and will be a learning tool as well. This is where V-Tech Kids comes in! V-Tech makes many of the favorite toys in our house. Toys that the kids play with for years and also learn a lot from them. An added bonus is that these toys have lasted us through two children and I am sure the third will love them too! Cody the Smart Cub™ is VTech's Newest introduction to their infant and preschool line. He introduces children to valuable every-day life skills like routines, first words, and emotions. He knows exactly what time is it, so your little ones will grow and learn morning greetings, bedtime music, holidays, and birthday wishes. With VTech's app store, The Learning Lodge, parents can share in the developmental journey online by personalizing their child's name, favorite stories, and more. Connect with VTech on Facebook and Twitter for the latest news and newest toys. 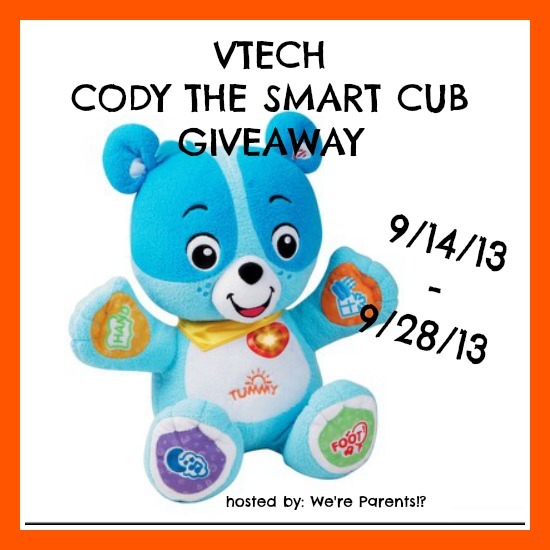 To see a full review of Cody the Smart Cub™ GO HERE. Open to US residents only!! Ends 9/29/13 at 1:00 AM EST. Disclosure: I received no compensation in exchange for promoting this giveaway. Participating bloggers are not responsible for prize fulfillment. I really, really want their Sit-to-Stand Learning Walker. It is on my wishlist.